Energy storage is the capture of energy produced at one time for use at a later time. Energy comes in multiple forms including radiation, chemical, gravitational potential, electrical potential, electricity, elevated temperature, latent heat, and kinetic. Energy storage involves converting energy from forms that are difficult to store to more conveniently or economically storable forms. Improve the efficiency of energy storage system (ESS) by collecting data such as ESS batteries, temperature, electric current, voltage, etc. 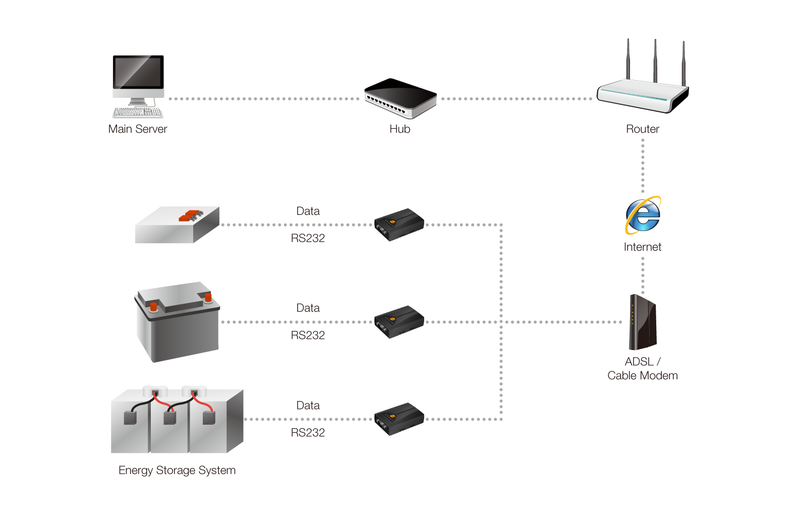 over the Internet with Sollae Systems’ serial Ethernet device server. Sollae Systems’ serial Ethernet device server can be applied to ESS to enable remote monitoring of the state of energy in the storage. This serial Ethernet device server, therefore, improves management efficiency of ESS by collecting data such as ESS batteries, temperature, electric current, voltage, etc. over the Internet. It consequently facilitates integrated management of numerous ESS, installed in a plurality of fields, at a central control center, while reducing maintenance cost.